NEXT | What are your last-minute goals before patch 8.1 hits WoW? What if one life was lost that should have continued? 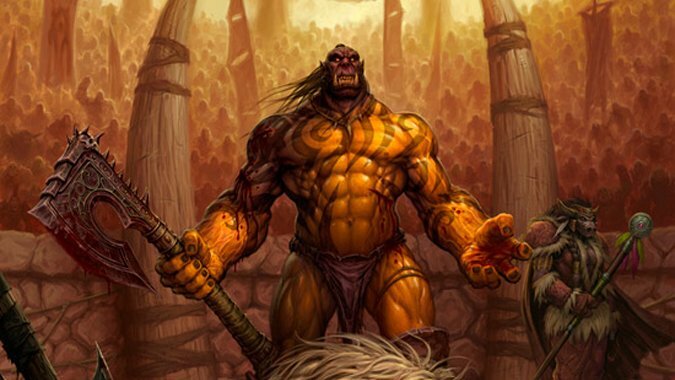 When we talk about the alternate Draenor that was the center of Warlords of Draenor, we talk of just such a world — a world where Grommash Hellscream’s mate Golka did not live to bear a son, a world where Gul’dan did not convince Grommash to drink the Blood of Mannoroth. A world where Archimonde, rather than Kil’jaeden, took control of the Legion’s plans and even brought war directly to the planet himself. A world where the Orcs created an Iron Horde before falling to corruption. A world where a Draenei named Yrel watched her sister Samaara die at the hands of Ner’zhul and the Shadowmoon Clan before watching Prophet Velen himself give his life to redeem the Naaru K’ara from her void state, purging the Dark Star and creating a beacon that in time other Naaru would follow. A familiar world, but one where history diverged before the arrival of a Bronze Dragon and a time-displaced Orc pushed it even further. Now, in Battle for Azeroth we hear more — that once we returned to our world, some thirty years passed on that Draenor, and they sought to repair the damage to their world caused when the Fel Horde helped Archimonde and the Burning Legion invade. Orcs and Draenei worked together for a time, we’re told, before the Naaru called the Light Mother arrived. In visions High Exarch Yrel was convinced that her people had a greater destiny than merely to protect one world — that they would be the nucleus of a great army that would march across the Great Dark Beyond and protect it from all evil. The Mag’har tell us that the Draenei grew fanatical. When Horde emissaries visit Draenor to recruit the Mag’har, the delegation also sees the Lightbound — an army of Draenei, Orcs, and even a few Ogres who have come together under High Exarch Yrel’s banner. 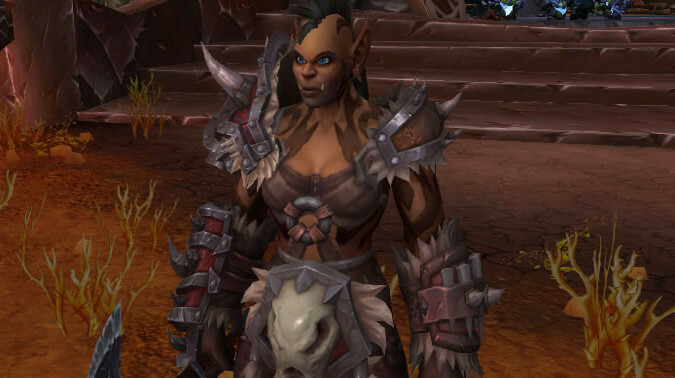 The Mag’har Geya’rah, daughter of Durotan and Draka in this alternate world, painted a bleak picture of fanaticism and the imposition of the Holy Light on Orcs who did not accept it. It’s impossible to ignore the echo from our time — how when Xe’ra the Lightmother met Illidan Stormrage, she attempted to force the Holy Light onto him. We are forced to accept that perhaps it is so. We know that Grommash had a son in this reality, although we don’t know with who — his mate Golka died well before the Legion invasion of Draenor and never bore Garrosh in this reality, so whoever High Exarch Hellscream is, he’s not Garrosh. But strangely, for all that the Mag’har tell us that the Draenei became fanatical, when the Lightbound fight the Mag’har they do so attempting to convince the Mag’har to stand down. When High Exarch Yrel fights Grommash, she explicitly offers him a chance to stop fighting. And for all that Geya’rah says that the Draenei are forcing the gift on others, she also says that some Orcs — including Hellscream’s son — chose the Light willingly, even calling those that did so traitors. We’re left to wonder exactly what High Exarch Yrel is doing. The Lightbound repeatedly claim that the Mag’har are responsible for Draenor’s demise, as the world is dying. High Exarch Yrel yells: Grommash Hellscream. It has been a long time. Grommash Hellscream yells: High Exarch. A rare… honor. High Exarch Yrel yells: I have come to offer you one last chance to embrace the Light. High Exarch Yrel yells: Your people are choking the life from this world… dooming the land to desiccation. Grommash Hellscream yells: How can you be so blind, Yrel? It is the Light that has doomed this world! High Exarch Yrel yells: It pains me to lose an old friend, Grommash. But… very well. We will settle this your way. Each side claims the other is responsible. 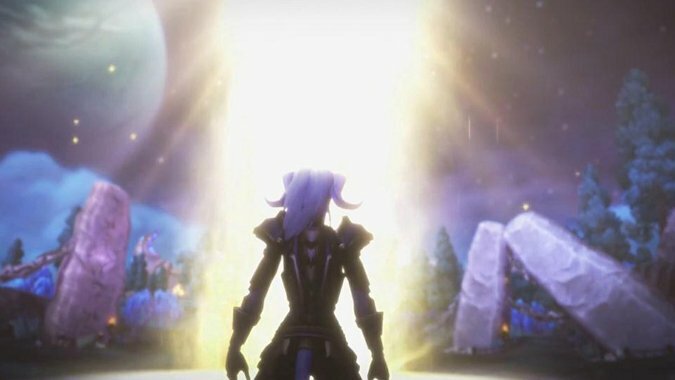 We know that in our reality, Xe’ra was willing to force the Light onto Illidan, but does that mean that the Light Mother on the alternate Draenor is actually doing so? What does Yrel mean when she accuses the Mag’har of choking the life from Draenor? It’s not like we haven’t seen Orcs do this at least once before, but we know the Mag’har are untainted by Fel corruption. Remember that the Grommash of the alternate Draenor didn’t drink the Blood of Mannoroth because he was warned by our Garrosh. Also remember that when Garrosh traveled to their world, he brought with him followers such as Zaela. He also brought the war machines that the Iron Horde made such good use of, or at least the plans to manufacture them, and even brought Goblins to help construct them. So, did he bring something else? One of the secrets that Garrosh learned to use during his time as Warchief of the Horde and later, of the True Horde, was that of Dark Shamanism. It owed nothing to the Fel but was instead brought to the Horde by defectors from the Twilight’s Hammer — and we know that the Twilight’s Hammer was created by Cho’gall to worship and serve the Old Gods and the Void. While Garrosh failed to tap into the power of Y’Shaarj we know there were not one but two Naaru on Draenor who became Void Gods. There was the Dark Star itself, only purged of the Void by the sacrifice of Velen to re-form into Kara. The other was Decimatus, was born out of K’ure in Oshu’gun, whose corrupting influence helped create the Pale Orcs that served the alternate Cho’gall when he helped usher in the Void God transformation. Considering how hostile the Mag’har appear to be to the Light, it’s quite feasible they fell back on Dark Shamanism, tapping into the power of the Void, especially if any of the Shadowmoon Clan that worked for the Iron Horde under Ner’zhul ever joined their ranks. After all, when he was Warchief of the Iron Horde, Grommash didn’t shy away from using the Void to achieve victory. Imagine then, that both sides are correct from a certain point of view. The Mag’har believe the Holy Light is an oppressive force that steals free will and turns Orcs who embrace it on their own people. We’ve seen that it can be, since Xe’ra definitely attempted to use it to convert Illidan to her purpose against his will. Also consider Lothraxion, the Nathrezim who is infused with the Holy Light. While we’ve never been told he wasn’t a willing convert, we’ve also never strictly been told he was — until we saw Xe’ra attempt to impose the Light on Illidan we had no idea it could be. But it’s also true that the vast majority of those we see embracing the Holy Light do so of their own accord — for example, none of the Paladins we’ve seen have ever been forced to embrace the Light. Meanwhile, the Lightbound believe the Mag’har are responsible for Draenor’s dessication, and if they turned to Dark Shamanism learned from Garrosh’s followers — who were themselves former members of the Twilight’s Hammer and thus servants of the Old Gods and the Void — then they very well may have been responsible. 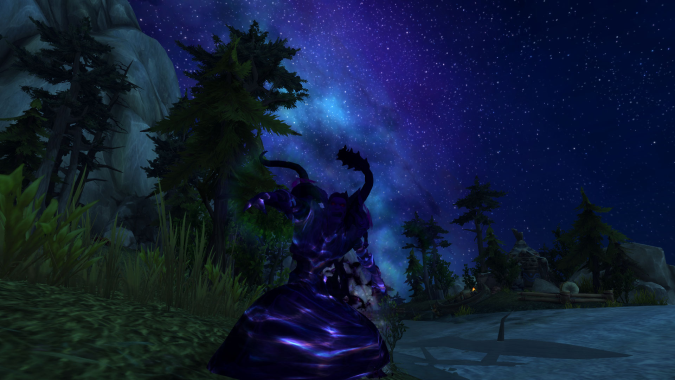 The Draenei and Mag’har themselves would therefore be pawns in a cosmic game between Light and Shadow. But to what end? Next week, we’ll talk about Yrel, her sister Samaara, Divinius and why there doesn’t seem to be a Yrel in our timeline, and why that may be of crucial importance in understanding the fate of two worlds.